As the Duke and Duchess of Cambridge celebrate the birth of Princess Charlotte, award-winning zoo Drusillas Park has welcomed two high profile arrivals of their own. Amongst the bouncing baby bundles is a critically endangered Suawesi macaque and a rare black lemur. 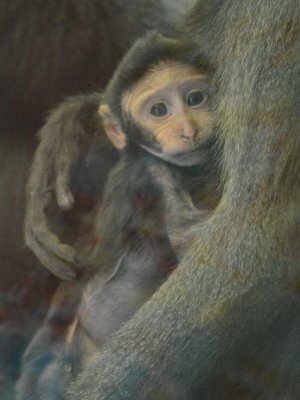 A new prince was born into the Sulawesi black macaque family on 18th March and is doing well under the guidance of proud parents, Kendari and Moteck. These large monkeys are native to the Indonesian island of Sulawesi where the population has dropped by more than 80% in the last 40 years and they are now regarded as critically endangered by the IUCN (International Union for Conservation of Nature and Natural Resources). 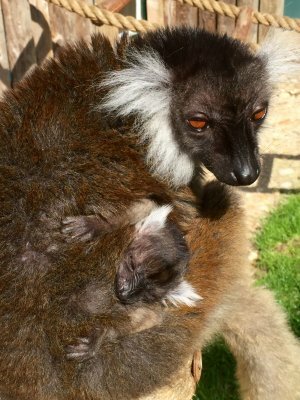 Then, less than a month later the celebrations continued with a new arrival in Lemurland. 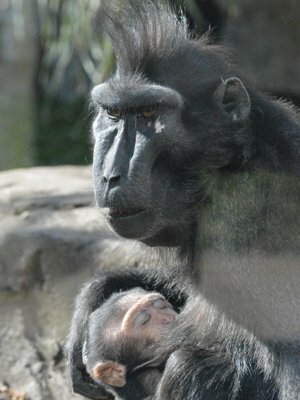 Born on 2nd April, the baby is growing in confidence daily under the close protection of mum Clementine. Over the next few months, it will gradually start to spend time away from the adults and explore the trees and ropes. For the time being however, it is happier hitch-hiking a ride on mum.